Shada has the odd infamy of being the only Doctor Who story never to be completed and transmitted. The strikes, which the unions held the year of its making, first damaged the production and then, with limited recourses, the show lost out to other programs for studio time. So, there existed a Douglas Adams story out there which with the addition of a few bells and whistles could have been seed. This tantalising prospect kept Shada foremost in fans minds. Various attempts were made to complete the story with Big Finish doing their own version with Paul McGann and the story altered to fit the eighth Doctor. 1992 saw a video tape (ask your parents, it was the cutting edge of technology along with the record and cassette tape) of the show released. 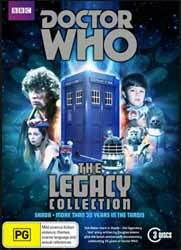 So, many a year has passed and technology has made leaps in ability and cost, so when I heard they were releasing Shada on DVD I suppose I was expecting something more than a transfer of the VHS tape, which is exactly what we get in the three discs The Legacy Collection. Shada tell the story of a lost prison planet where the Time Lords held the galaxies most dangerous, would-be, conquerors. Absentmindedly, the Time Lords have forgotten the planet's location, the information now only residing in the mind of a retired Time Lord, one Professor Chronotis, who has retired to Cambridge, posing as a college professor. As the galaxy is never short of would-be mass murderers, it throws up Skagra, who goes looking for the professor as he means to liberate one of the prison's inmates. His visit coincides with a visit to the professor by the Doctor and Romana. Shada is a six part show starring Tom Baker and Lalla Ward, the show was written by Douglas Adams and directed by Pennant Roberts. As the story was never completed an introduction and linking narration is provided by Tom Baker. The story, even had it been completed, would not have been the lost treasure that some fans seemed to think it was. It an ‘ok’ story, but as it stands incomplete, it’s unfair to be overly critical of the story. That said, Skagra’s outfit would have looked awful even when the show was originally planned to be shown, the white and silver delight would not have looked out of place in a sixties German gay bar. The main cast, including Christopher Neame (Skagra) and Denis Carey (Chronotis) are top notch in their roles and the filmed outdoor scenes look gorgeous. So, on disc one you get the transfer of the VHS version of the story, but pop the disc in a PC and you’ll gain access to the BBCi/Big Finish flash animated Paul McGann version, both feature Lalla Ward. Disc two is where the extras reside. One of the things which I have always enjoyed about Who extras is that they take their subject seriously, without being pompously po faced. Taken Out of Time (25 min, 38 sec) is the documentary which looks at the making and ultimate failure to complete the show, with contributions from many of the surviving cast and crew, including Daniel Hill (Chris Parsons), director Pennant Roberts, Tom Baker et al. Now & Then (12 min, 44 sec) continues the series of features which look at how locations appear now. Strike! Strike! Strike! (27 min, 48 sec) takes a look at how strikes affected not only this show but also ITV and the BBC in general, it a nice slice of social history, interesting and well presented. Being a Girl (30 min, 11 sec) takes a look at how females, particularly the companions, have been portrayed in the history of the show, this is juxtaposed with how the boys faired. The disc is wrapped up with a Photo Gallery. Keeping with the retro feel to the package the third disc opens with More Than Thirty Years in the Tardis (1 hr, 27 min, 53 sec), which if you do the math is a documentary about the show that is now approximately twenty years old. The documentary covers the show from its inception up to Sylvester McCoy's stint as the good Doc. Being an older programme it is still well worth watching (if you didn’t already own the VHS), as many characters involved in the show were still around. It also includes many shots from the show as well as specially recorded material. Remembering Nicholas Courtney (25 min, 59 sec) is presented by Michael McManus, friend and biographer of the much loved late Who stalwart. He was in the process of doing a full documentary when Nicholas passed away. Here he presents his life story, including the surviving footage from the documentary. The disc closes with a number of smaller pieces, including, Doctor Who Stories - Peter Purvis (13 min, 32 sec) wherein he recounts stories from his time on the show. The Lambert Tapes - Part One (10 min, 36 sec) has Verity Lambert being interviewed in 2003. Those Deadly Divas (22 min, 39 sec) is a fluffy piece around discussing Divaish behaviour by some of the shows characters. The disc wraps up with PDF materials, another photo gallery and subtitles for the disc. It’s an odd situation when you find yourself recommending a set, not on the strength of the central story, which is alright, but certainly no classic, but on the strength of the extras, which are extensive. Obviously, if you already own the VHS, you’re still getting a better quality picture on a media which is less likely to fade away, so the set is still worth picking up.